NO V.A.T. TO ADD - THE PRICE YOU SEE IS THE PRICE YOU PAY! 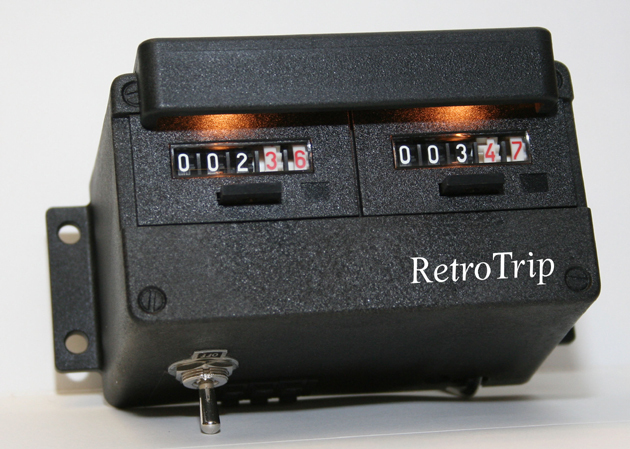 Introducing the famous Brantz RetroTrip rally tripmeter. This unit has been specifically designed to complement historic or retrospective motorsport and is approved for use on many major historic and classic rallies. The RetroTrip has sufficient functions for all the major competitive historic events and features fiddle-proof electro-mechanical clicking digits. The unit offers instant 'one in a thousand' calibration for any wheel changes and, like all Brantz meters, accuracy is excellent. 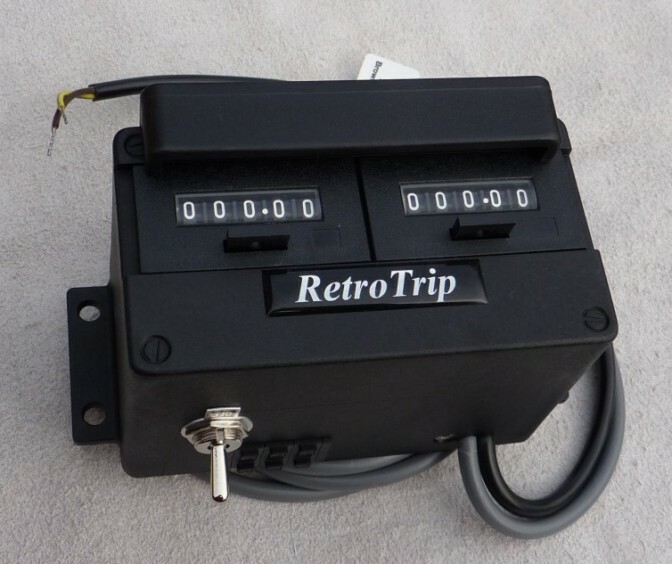 The RetroTrip can be used with a wide range of motion sensors: the wheel type sensor or speedometer type being the most popular. As ever, the fitting and calibration of the meter is a simple and efficient task. Exactly the same as above but with all black counters, which radically alters the appearance. This unit has been specifically designed to complement historic or retrospective motorsport and is approved for use on many major historic and classic rallies. 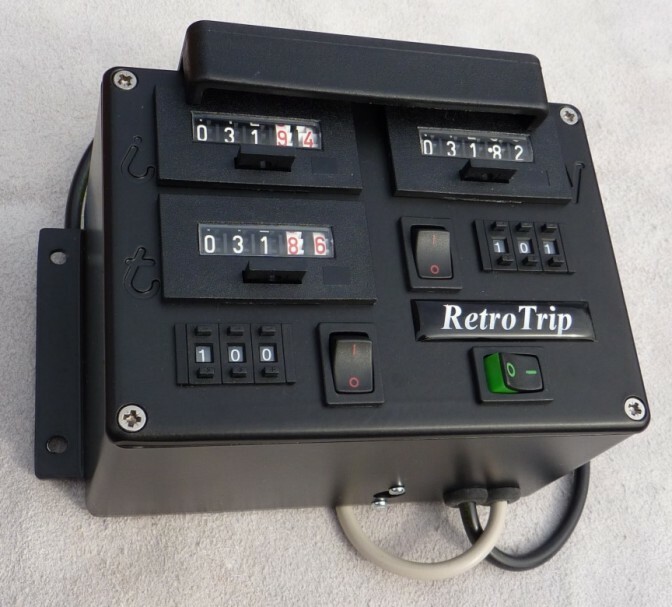 The RetroTrip 3 is a simple evolution of the ever popular RetroTrip 2 mechanical rally tripmeter. 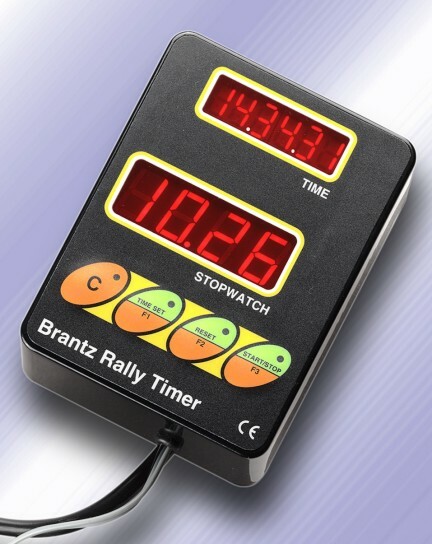 It has all the same features such as accurate one-in-a-thousand calibration and mechanical read-outs which make the tripmeters from Brantz eligible for historic type rallies throughout the world. total and intermediate distances, whilst a second tripmeter with its own calibration system drives a third readout on the right of the box. Both tripmeters are fed from the same single sensor fitted to either the speedometer cable or the road wheel. All counters can be zeroed independently while the counter on the top row can also be disconnected via a rocker control. 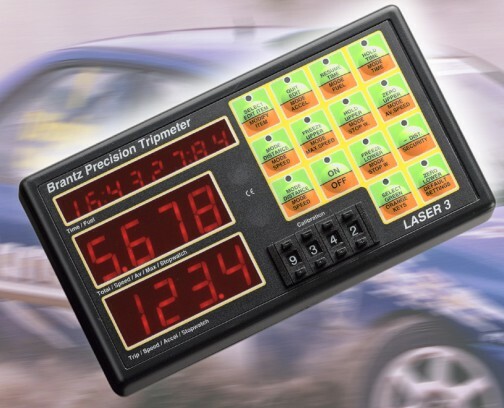 A basic International 1 single display rally tripmeter, ideal for road rallying and club level stage events. 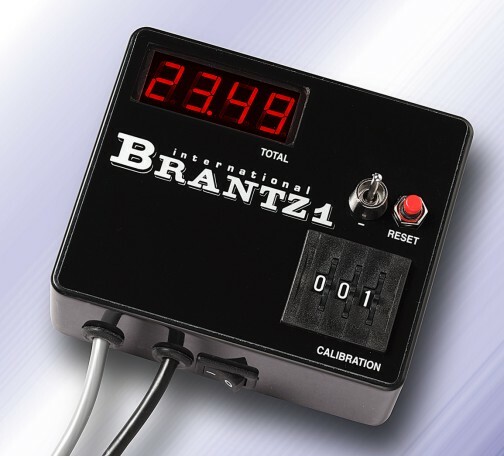 The International 1 features the same commitment to quality and accuracy as all Brantz tripmeters. 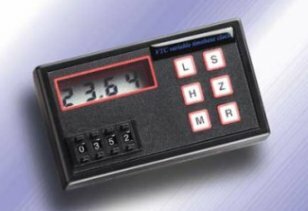 Our excellent 0.6 inch light emitting display and accurate calibration systems are coupled with a power switch and fuse to offer the very best entry level tripmeter. Has remote zero unit fitted. 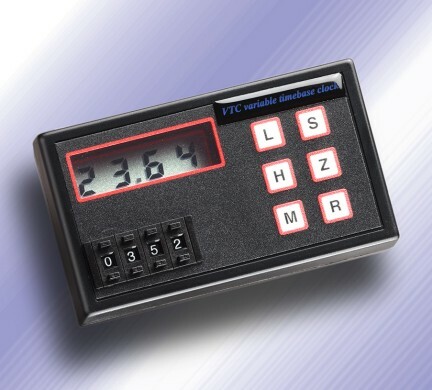 The International 2 is a highly accurate unit featuring very large light emitting displays of 0.6 inches and is ideal for stage rally applications where a dual readout is required. 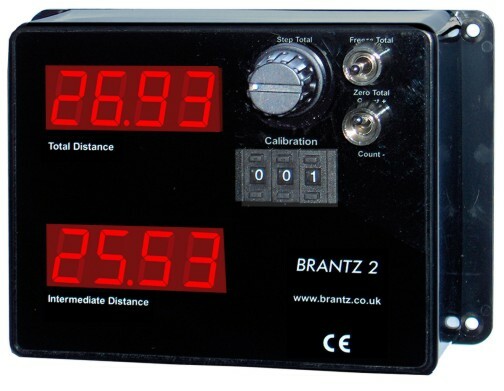 Brantz rally tripmeters calibrate electronically to indicate hundredths of a mile/kilometer, while a unique Brantz feature allows the Total readout to shift the decimal point of the distance meter to give a maximum value of 999.9 miles or kilometers - useful for the long distance competitions. Changes to wheel sizes or gearing ratios are instantly accommodated by the calibration. A remote reset button is provided as standard equipment to zero the lower Intermediate display. Controls on the meter will zero both Total and Intermediate values whilst also able to freeze the Total display. In addition the Total can be stepped, fast or slow, to any reading to align with the rally organisers road book if a deviation from the intended route has been made. 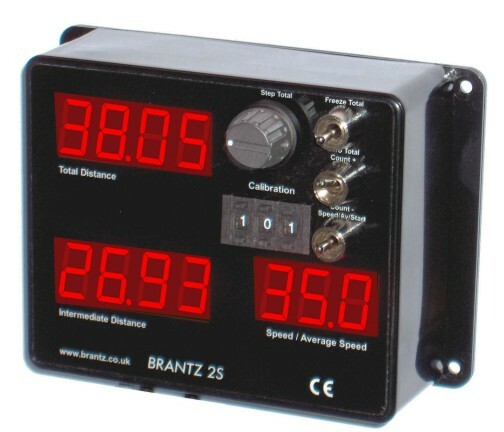 Brantz International 2 'RETRO' Tripmeter - Limited stocks available. We were asked to reproduce the 80s version of the International 2 and they have proved to be popular among the owners of 80s rally cars who prefer the correct period look to their dashboards. This is basically a modern BR6 with all the functions of the latest unit but in a 1980s case. The International 2 'S' Pro is the natural progression from the formidable International 2 rally tripmeter. The unit features the same highly visible LED display, with the addition of a highly accurate speedometer. The technical specification is similar to the International 2 unit, with the additional speedometer able to calculate and display both current and average speed. The Brantz Laser 3 provides the greatest degree of competitive edge in professional level rallying. 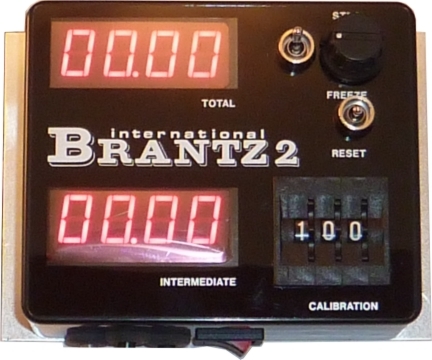 The Brantz Laser 3 Rally Computer is a sophisticated high precision instrument which shows via red LED readouts Time of Day including hundredths of a second and has two stopwatches. Six digit distance (to three decimal places) is viewed via shiftable four digit windows. Speed information includes current, maximum and average speeds. A leap forward in technology allows optimisation of car performance tuning using the acceleration figures to 60, 100 and 120 mph and kph from 0, 30, 50 and 70 mph and kph, along with times for a standing start quarter mile or kilometer, and a standing start mile or kilometer. A programmable digital fuel gauge is provided which will read a gauge which stands unpowered, or is already part of a vehicle's electrical system. Brantz - Plug Kit (factory fitted to unit). Allows sharing your Tripmeter between vehicles and removal for security. A5 model choose beep at 10 metre or 100 metres. Speed to one decimal place. This Speedtable (VERSION A5 manual) allows competitors to quickly program any speed to one decimal pace. Keeping the car’s tripmeter matched to the speedtable figure creates very accurate average speed attainment. The unit is battery operated, has back-lighting which is operated by the ‘L’ button, beeps at each increment if you wish it, and needs no connection to the car. Specifications: 4 digit large LCD readout. 4 mechanical push-switches to calibrate to any speed 0.1kph to 999.9 mph (either mph or kph). Solid state back-lighting. Audible beep on or off by use of S button. Small (10cm long) pocket size case. PP3 (9 volt) alkaline battery operated. A quality battery lasts for several days continuous use. Fits in the pocket much better then old fashioned average speed tables! A9 model choose beep at 100 metres or 1kilometre. Speed to one decimal place. This Speedtable (VERSION A9 manual) allows competitors to quickly program any speed to one decimal pace. Keeping the car’s tripmeter matched to the speedtable figure creates very accurate average speed attainment. The unit is battery operated, has back-lighting which is operated by the ‘L’ button, beeps at each increment if you wish it, and needs no connection to the car. is only a second in it. Hard wires in to Laser 3 meter. This zeros the intermediate display only. to the navigators seat etc. with a velcro pad. 13.8V output - essential for Historic vehicles! A return to base modification is available on these meters to allow the use of new sensors. Check the gearbox output size before ordering. Sq drive may need minor modifications. Hall Effect sensor and two magnets with holders and shaft fastners. The Magnets are attached to a revolving driveshaft or prop shaft.